Widmer Model P-400 Manual Perforator - New Phoenix Inc. The Widmer Model P-400 Manual Perforator is a steadfast and sturdy tabletop perforator that is both compact and portable -and is DMV “VOID” compliant. 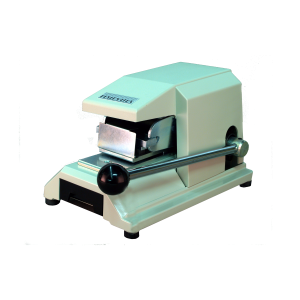 The Widmer Model P-400 Perforator is a steadfast and sturdy tabletop perforator that is both compact and portable. Now includes a recent update design – a backstop which will insure the proper placement of the “VOID” perforation on surrender Driver’s Licenses and I.D. Cards. This machine is safe and easy to operate. The extra long lever provides a smooth, single cutting action. This secure method of punching holes in documents permanently cancels or validates up to 8 documents simultaneously.